It can be hard to grow on Instagram consistently, right? What if I told you that with five simple steps... you could DOUBLE your followers in a month? I know, I know. It sounds whack. I've been growing Instagram accounts for clients since 2013 – accumulating over 250,000 followers along the way. My own personal account @EliseDarma grew to over 60,000 in less than a year, resulting in more clients booked into my agency business, higher revenue, free travel, and multiple brand collaborations with companies like PACK, Surf Office, NomadLife and Lo & Sons. I managed to do this WITHOUT buying followers (please don't), running ads, or having an existing audience elsewhere on the Interwebs that I simply lured over to my Instagram account. As of today's publishing date, the Name and Username fields are the ONLY parts of your profile that can be found via search. To attract your ideal follower, you want to use keywords in these sections that THEY are already searching for. 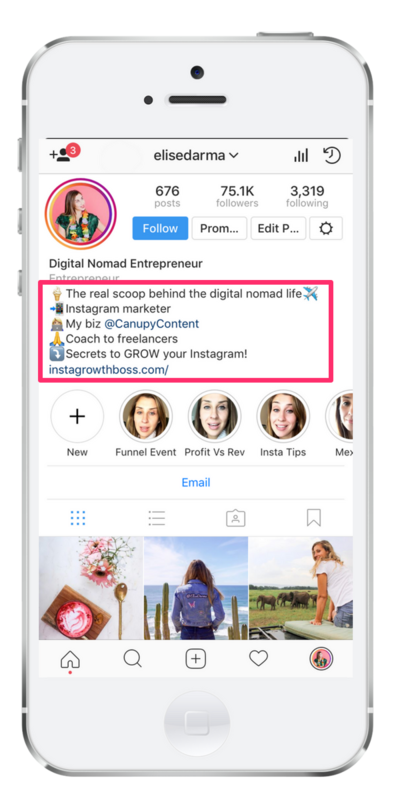 By doing this simple trick, your profile will come up higher in Instagram's search results and your account will get a mini traffic boost. Pick a Username that's as close to your brand name as possible. Keep it simple and memorable. Avoid long, complicated, hard-to-read or double entendre letter combinations. If your brand name is already taken, add a short word before or after. For example: "the," "your," "visit" or "shop." The name field is the juicy part of your Instagram profile. It's where you can drop a targeted keyword or two that your ideal followers are ALREADY searching for to supercharge your account. What NICHE is your account in? Travel, fashion, business, etc. WHO is your ideal follower? The NICHE for my @EliseDarma account is travel. The PURPOSE of my account is to help others travel more by starting their own business. My IDEAL follower is someone who is interested in travel and becoming a digital nomad. So in my Name field, I've used the keywords "Digital Nomad Entrepreneur." You only have 30 characters for this field, so take your time finding the best search-friendly keywords. Once a potential follower has found your account through search, your bio needs to tell them WHY they should follow your account. So how do you craft a winning bio? Speak like your target audience. Use that jargon! Share the VALUE your account offers. The last line of your bio needs to tell people WHY they should click on the one link you're given to share on your profile. Spend 15-20 minutes writing your bio. Make sure it's clear, punchy and succinct as possible. Don't be afraid to use emojis to add some personality, or save on character space to get your message across. Whether you realize it or not, by building an Instagram feed, you’re building a brand. To be successful on Instagram, you need a CONSISTENT focus for your feed, a COHESIVE design theme, and high-QUALITY content. Here are my top tips for mastering this Instagram trifecta to skyrocket your growth. When I started to grow my personal account, I decided that travel would be my main theme. But because I'm a real person with multi-faceted interests, I wanted my account to have a secondary focus: being an entrepreneur and a digital nomad. With these two themes, I decided I would curate my feed around my travel photography and lifestyle images of me working around the world. Why is having a theme design SO important? It creates an easy-on-the-eyes, predictable feed, and lets your potential follower know what kind of content they can expect from your account. I've kept my feed design pretty simple over the years. From the popular checkerboard pattern to random quotes with white backgrounds, I experimented until I found a design that works well with my brand. 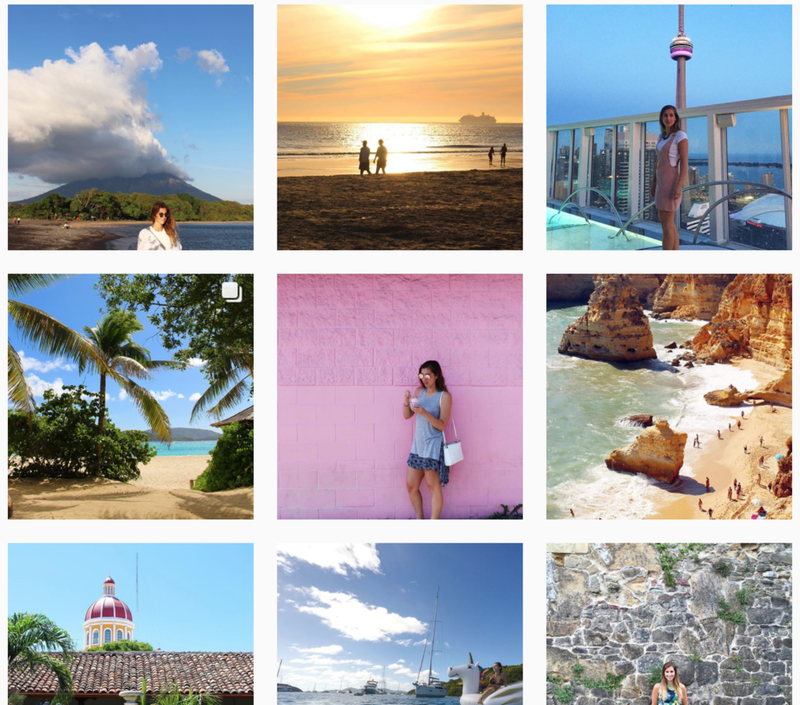 Hashtags are the #1 reason I've received free travel, brand sponsorships and major media features (to the tune of Forbes and Entrepreneur.com). They are a way for you to tag your post with the keywords that your target audience is using. What's the BIGGEST hashtag mistake people make? Choosing the most popular hashtags. Your post will quickly be lost in the flood of other images, and your chance of discovery will hit 0% pretty quickly. If your account is brand new, aim for 1,000 to 10,000 posts per hashtag. If your account has over 5,000 followers, find hashtags used in up to 100,000 posts. And if you're over 20,000 followers, use hashtags with about 250K posts. By following this rule of thumb (since these numbers can vary depending on the niche that you're in), not only will your posts get the extra visibility they deserve, but you'll have a higher chance of landing a spot in the top posts section (and being found by a target followers). Step 1: Type in your account’s keyword, niche, focus, or category into the Instagram.com search bar, like: "#________." Step 2: Scroll down through the hashtags and find one that matches your account’s focus, and has between 10,000 and 50,000 posts. If you can’t find any good ones, try a new version of your keyword. Step 3: Keep going through this exercise until you’ve found 10 hashtags you’re happy with (if you've got the time, find 30). Use them in your next post, by sharing them in the caption or first comment. The secret sauce to growing an Instagram account is ENGAGEMENT. Hashtags work in the background, but they eventually run out of juice the older your last post becomes. You've gotta be proactive by liking, commenting and following accounts in your niche. If you're interested to learn my strategies on boosting engagement on Instagram so that your posts are seen by MORE people – join me for my free masterclass. My posting system CHECT – that actually works to get you growth and engagement! ➡️ Sign up for the free class HERE.